Holy carp guys. What I am about to share is going to CHANGE MY LIFE. My gardening life anyway. Or more specifically, my garlic-growing life. 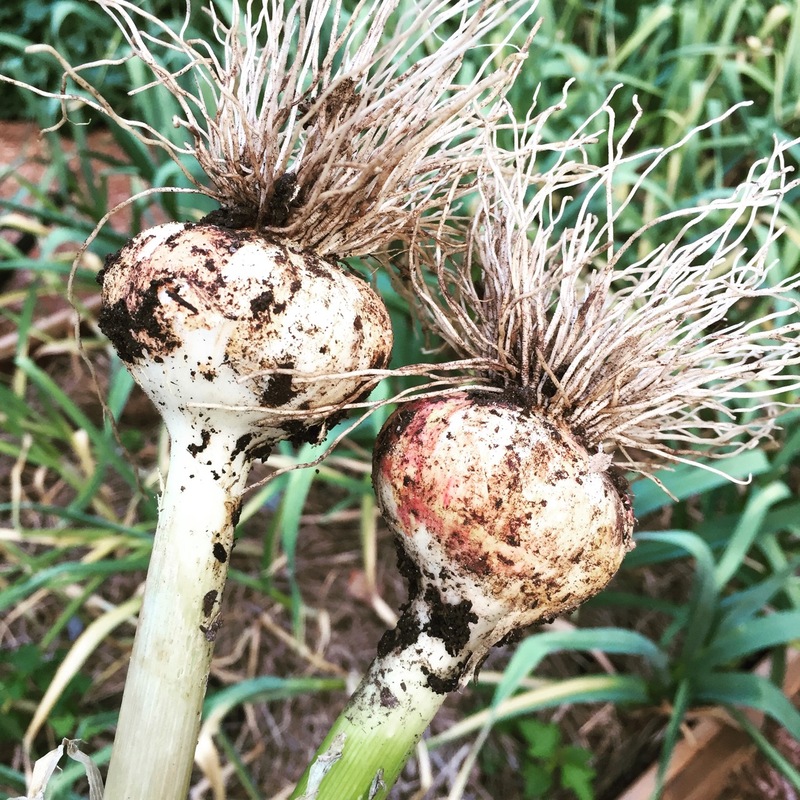 Last year (um yeah… that was my last post… don’t judge) I published my heartbroken post of discovering what my years-long problem had been with my garlic, which was to discover that I had a very bad infection of the dreaded stem and garlic nematode. This meant I could no longer grow my crops at the farm, at least not in the usual garden plot. My dear hub suggested we redo the upper level of our front yard to ditch the hard-to-keep-alive grass entirely, and enlarge my two 4×6′ raised veggie beds into three 4×11′ beds. We got a head start on one of them last fall so that I’d have it ready for garlic. 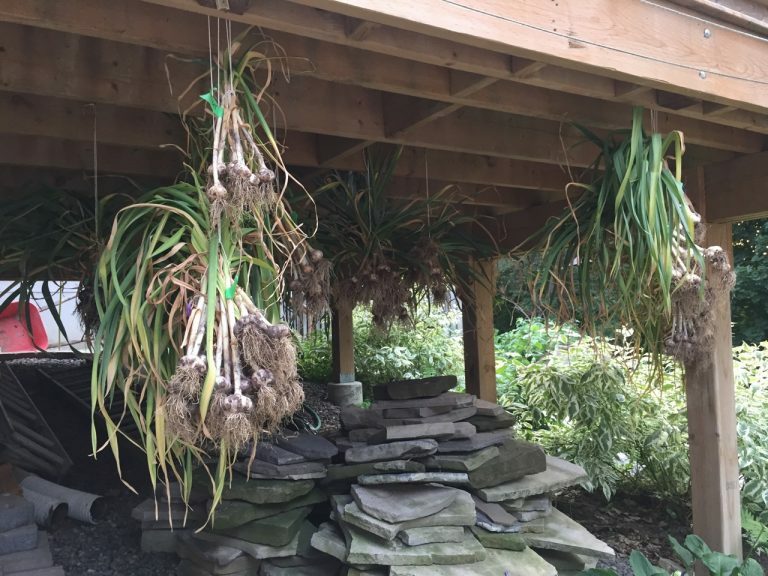 I had to buy all new garlic seed (not an inexpensive proposition) and ditch much of last year’s crop (you can still eat the infested garlic, you just don’t want to be planting it, or contaminating your compost with the papers). This all went according to plan, but I have had nagging concerns in the back of my mind ever since that I may still have the nasty pest lurking about. Some of my garlic started looking a bit worrisome by late June: some varieties were tilting over and the leaves started yellowing. I pulled a few heads up to have a look at them and frankly, they looked great. Very healthy looking root systems and papers. They just seemed to be ready early this year. Which shouldn’t be a big surprise I guess; it’s been incredibly hot for a while with little rain. I ended up harvesting the whole patch a week ago, which is a good two to three weeks earlier than normal. Everything is hanging and drying under my deck; it’s a little risky as it could get exposed to rain but there is better airflow there than in my garage and more room. All of it looked really healthy; lots of strong roots, no yellowed or rotting papers. But I still worry about having the nematode, and what to do if I do. If I get an infestation here, my garlic growing days are done for a long while. There is very little you can do to rid yourself of it once its established. So getting to the life-changing part. I’ve been wondering if there’s a way to check on the health of my garlic. Is there a test? Can I do it at home? Can I do it without a microscope and other science-lab equipment? The answer is YES. YES THERE IS. Thanks to the wonder of YouTube and Smartphones, the only equipment really needed is some glass slides. And really, you can probably avoid using glass slides if you happen to have some clear, flat glass kicking around, like from a picture frame. Get some distilled water, some peroxide and some lights, and Bob’s your uncle. Thx to YouTuber Andy Leahy for the video. So sometime this week I plan to try this out and have a look at my latest crop. What happens if I see the squirmy little nasties? Well, that’s a good question. I’m not sure. But I do know that it means I would potentially need to buy new seed again. I have grown the garlic in just one of my beds, and that’s the one with the suspect soil (the other two beds have new soil in them that we had trucked in). This isn’t a guaranteed solution; it’s not that clear to me how far the little worms can travel through soil, but it would be a start – to stick to growing garlic in one of the other two (potentially) unaffected beds. There is another control method I’ve been looking at, which is called bio-fumigation. This requires planting oriental mustard seed into your growing area and then cultivating it into the soil before it flowers and goes to seed. This is shown to be an effective method for control, but I still think it means buying new, clean seed. But if cycling through new seed annually and interplanting with mustard is a way to keep me growing garlic, this may still be worth it. There’s nothing like fresh, homegrown garlic, and out of all the veggies I have been growing, really, garlic and tomatoes are, in my opinion, my best bang-for-buck crops (considering my small growing space).